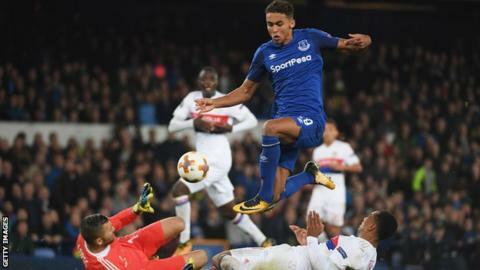 Everton forward Dominic Calvert-Lewin and defenders Jonjoe Kenny and Mason Holgate have signed long-term deals at the club. Calvert-Lewin, who scored the winning goal as England won the Under-20 World Cup, has signed until June 2023. The 20-year-old has scored six goals in 28 games this season. Right-back Kenny, 20, who made his first Premier League start in October and centre-back Holgate, 21, have signed until June 2022. "There's no doubt in my mind that they will play big roles at Everton for a long time to come," said Toffees boss Sam Allardyce. "Mason, Jonjoe and Dominic epitomise what we are trying to accomplish with young players here at Everton".